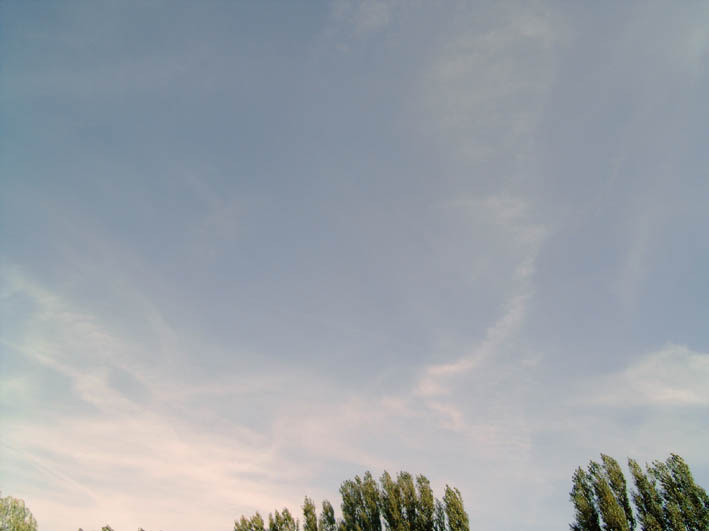 As Fred states in his mail to you "They really are desperate" that is the feeling I got to lately; an awful lot of spraying is going on but it seem to dissipate into nothing or genuine clouds (Sylphs?) though we have our share of residue of course; coughing, headache and stuff, but I am sure things are moving fast now they run out of time. I found a forum here on NWO chemtrails here in Holland too, not very professional but dedicated and active: they informed the main newspapers and the parliament (they already know as we know) had an interview in a main newspaper (cynical comments of course) and have a hitrate of about 1200 pageviews a day, not bad. Well just to keep you posted of things at this side of the ocean. We have a fair after-season here, after a rainy summer and very wet August. Nice and sunny but with awful lot of strange clouds and people not feeling very well. X patterns and cris cross lines are everywhere (I travel a lot around the country) specially above my neighbourhood a lot of CT's and I can see the difference between Con and Chemtrails cause we are below the approach route to our national airport, so we see a lot of planes flying over. A lot don't leave trails at all; a few have contrails and, strange enough, the one that made the Chemtrails are not so visible...all the time, but we do see them! Since I am not an expert at all, I need some confirmation here, but I think I start getting the feeling :-) for these things. Today we had a great sunny day and I went with my wife and youngest daughter to a theme park in the south part of Holland; Chems were visible all over the place and then I saw this Sylph! 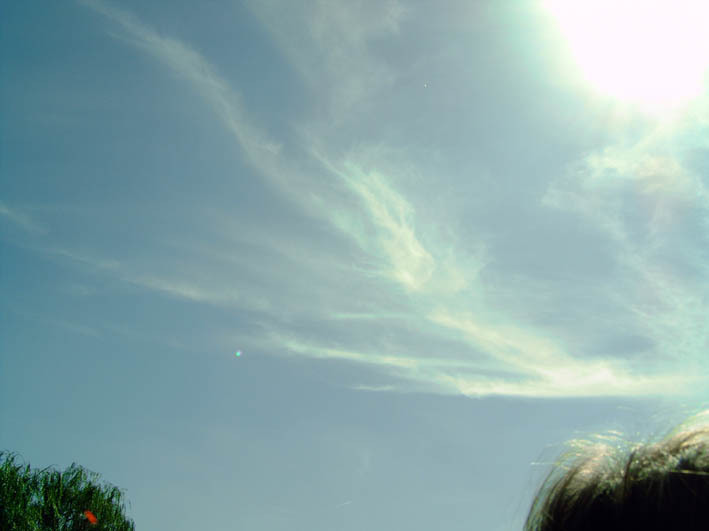 It seems to dissipate the trails, so I took some pics (it was against the sun, so not very sharp). I did some photoshop on one pic (auto level) to enhance the image . I Also enclose the original here. My feeling that things are moving fast grows stronger everyday, I am very curious what you both think of it. Yes you have a lot of sylphs in your photos. 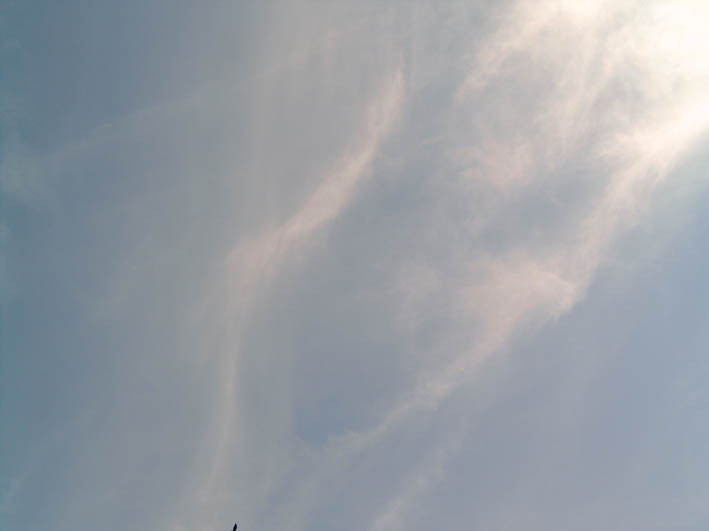 In the first picture, there is one in the center of the frame drawing chemtrails into itself. There is a vortex of energy working on the CTs. The eye sees patterns and if your eye sees a pattern in the sky which does not fit the normal parameters, then in most cases something strange is happening. The second photo shows a CT being bent and twisted. The CT is a spiral shape as if an invisible tornado was working on it. In the third picture, the CTs are not smearing out creating an oily gray haze. The CT just right of center is twisted and spiraled. I am reminded of old haying practises of farmers where they rake the rows of mown hay over so that it dries. The hay forms a coil of stalks. There is a lot of sylph activity in this picture. The fourth picture is like tongues of fire or horizonal fork lightning covering the sky. CTs are being pulled into a giant sylph who spans a large part of the picture. This is where a lot of transmutation occurs. As most of the newly created water becomes ice particles at this altitude there is a cirrus wispiness to the former chemtrails. 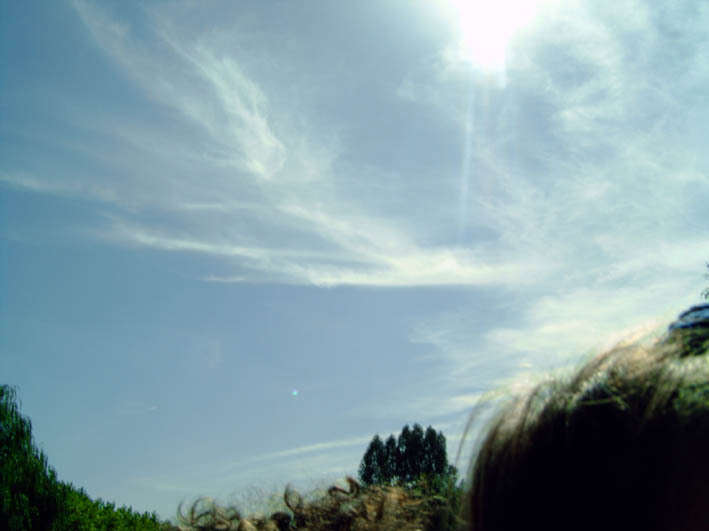 The fifth picture, from which the fourth picture was drawn, includes the sun and a large bank of haze on the right. 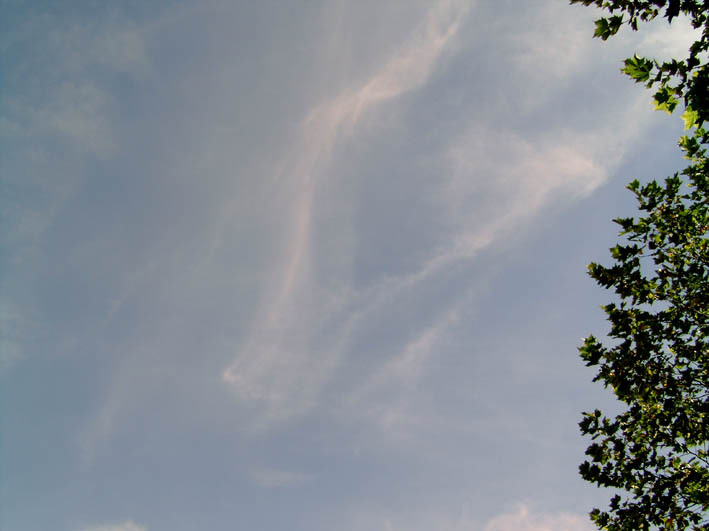 The bands of clouds behind the trees appear to be CTs that are being gathered for transmutation. Such activity happens when the jetstream is overhead. HAARP in Europe like HAARP in America and its version in Russia are attempting to control the flow of the jetstream in order to control weather. The footprint of the stratospheric jetstream into the troposphere of weather and clouds is like river of wispy clouds across the sky. The dry air of the jetstream moves at about 400 kilometers per hour. 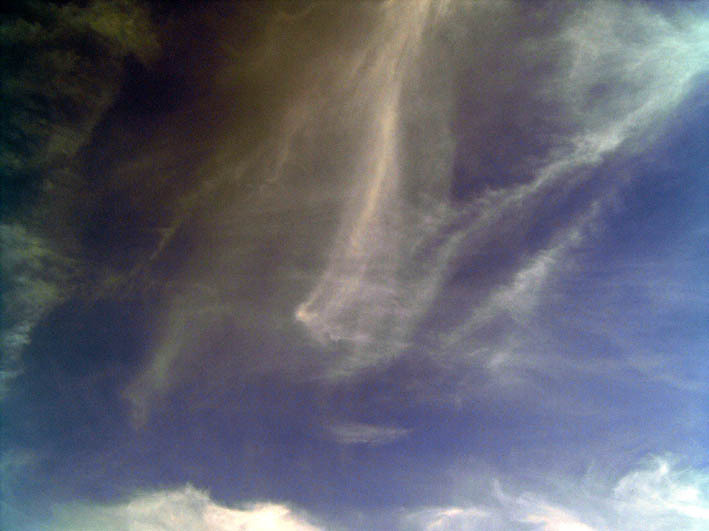 The wispy clouds move about 100 kilometers per hour. It is like the cold stream of frozen gases gushing from a fire extinguisher, the fastest moving gases are invisible, the gases on the edge of the spurt are full of ice particles. Such a river of clouds indicates the presence of the jetstream above. Sylphs use the jetstream and CT/HAARP activity is most pronounced on the jetstream. Both are trying to wrestle control of weather by controling the jetstream. The sylphs are winning. The sixth picture shows braided CTs and ice clouds. Horizontal across the middle of the photo are thin ribbons of energy spiralling at right angles to the CTs. It looks like a section of a DNA double helix. The double helix is tightly spun on the left side of the picture and looser on the right. The "mouth" of the sylph can be seen on the left creating the vortex which pulls the CTs into the sylph. This is an amazing picture as the lighting has to just right to see such fine detail. The seventh photo shows more CTs being pulled and spiralled. There is an invisible vortex creating the distortions of the CTs. Can you see the effect where the CTs are bent? Again the vortex is at right angles to the chemtrails. The sylphs are working with higher dimensional physics in dissolving the crud in the air.